You are here: Home / Politics / Another ‘Dewey Defeats Truman’ Moment? Another ‘Dewey Defeats Truman’ Moment? In the months leading up to the 1948 US presidential elections, incumbent Harry S Truman was routinely predicted as having no chance of defeating his challenger, Thomas Dewey. On the night before election day, every single one of the political reporters who had been with Truman as he campaigned back and forth across the country predicted that he would be soundly defeated. But a strange thing had been happening in the final weeks and months of the campaign: at every whistle stop and every city, the crowds gathering to listen to Harry Truman had been swelling, growing more and more enthusiastic about the candidate and his message with each appearance. The polls kept predicting a Dewey sweep, despite the fact that Dewey’s rallies had been shrinking as Truman’s had grown. 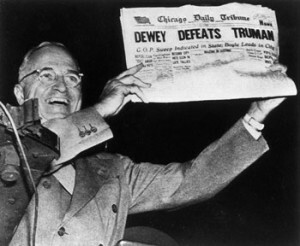 So certain were the media pundits that the Chicago Tribune wrote its famous “Dewey Defeats Truman” headline early on election day, and stubbornly stuck with it, until it finally became embarrassingly clear that the voters, ignoring the headlines and the pundits, had swept Truman back into office for another term. It was one of those rare times when people made up their minds at the very last minute, and hundreds of thousands of voters swung from being undecided to supporting Harry Truman almost as they made their way to the polls. But the signs had been there all along. Dewey was having trouble connecting, he seemed aloof and detached from the concerns and troubles of ordinary Americans, and the better the voters got to know him, the less they liked him. Truman was a man of the people, an uncomplicated, honest, straight-talking candidate who was instantly liked and trusted once people had an opportunity to see him, hear him, and shake his hand. I believe the American people had been withholding judgment on Mitt Romney until that first debate in Denver. The President’s campaign advisers had made Romney into a caricature of himself — a cold-hearted capitalist who loved nothing better than throwing workers out on the street while he shipped their jobs to China. The Mitt Romney the voters met in Denver was no cartoon cutout created by Democratic focus groups. He seemed to be the quintessential American, a man who loves his family and has worked to provide a good life for them. In Denver, Mitt Romney seemed competent, reasonable, measured, confident, a man with sensible ideas, a man who inspires trust. President Obama, unfortunately, has seemed anything but competent. He does not inspire trust. He does not seem to know what to do to get our nation back on its feet again. It has been painfully obvious to most Americans that Barack Obama has made our problems worse, far worse, during the past 4 years, through a combination of failed leadership and political policies that a throwback to the 1930’s. It sounds harsh, but the fact is that Barack Obama has been a terrible President. He is a typical college professor, full of grandiose ideas formulated in an ivory tower far removed from the daily realities of ordinary American life. He had 4 years to prove that his ideas could work, 2 of those years with complete control of the US Congress. He did what Democrats do best — he threw trillions of your dollars at the problems. And today, the country is hurting worse than when he took office. I believe the national mood has been shifting quietly and steadily in favor of Mitt Romney. I believe we are going to see another “Dewey Defeats Truman” moment, when the pundits and pollsters will be surprised to find that the country has been lifted by a quietly rising tide of confidence that Mitt Romney is the decent and competent leader who can guide America out of this morass. Get out tomorrow and vote for change, vote for competent leadership, vote to say “no more” to the failed policies of bigger and bigger government, more and more debt, a continuation of the politics of cronyism and gridlock. Mitt Romney has the experience and the proven policies to get America working again.